One of the days we were in Hilton Head, we decided to take a day trip to Hunting Island State Park in South Carolina. 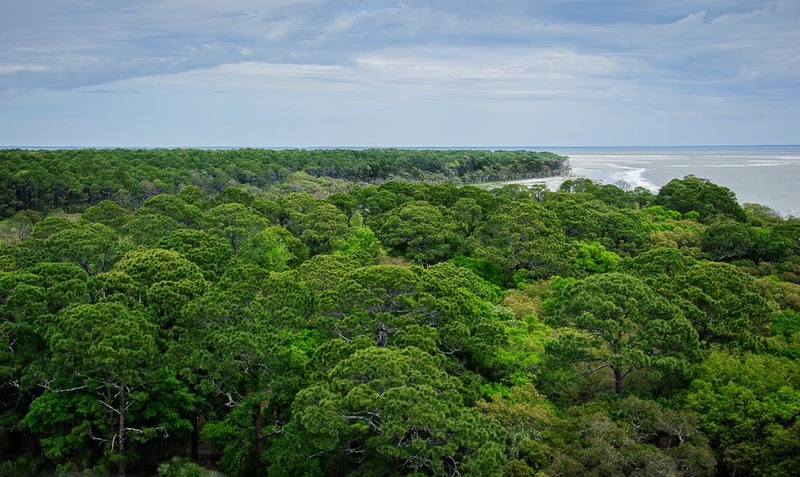 Hunting Island is about an hour from Hilton Head and is South Carolina’s most visited state park. It is a 5,000-acre park and it actually is a semitropical barrier island. One of the attractions in the park is the Hunting Island Light. The light is no longer operational and visitors can climb to the top for a nominal fee. The climb is about 150 feet and once you get to the light’s landing, you have a clear view of the surrounding area. Once I got to the top and went outside, I was taken with this view showing all of the different shades of green that contrasted beautifully with the blue sky.